December 11, 2017, 2:36 PM · In an effort to promote the coverage of live violin performance, Violinist.com each week presents links to reviews of notable concerts and recitals around the world. 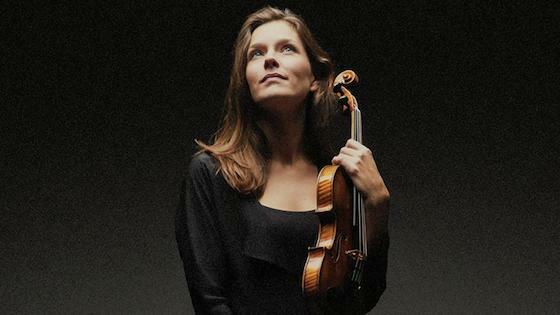 Janine Jansen performed works by Bartók, Szymanowski and Messiaen in concert at Carnegie Hall. The New York Times: "Her focus and silvery tone, the way she sustains the musical line beyond what you thought possible, renders even passages of haziness fundamentally lucid." Tim Fain performed Glass' Violin Concerto No. 2 with the American Composers Orchestra. The New York Times: "The string writing that accompanied this digital swirl was most memorable when it jumped between stasis and sudden glissando surges. For most of its 10 minutes, 'GAMA XVI' recalled the electroacoustic mystery of Pauline Oliveros. But near the end, firmer pulsations were clearer reminders of Mr. Glass, as was a cameo appearance by the violinist Tim Fain, a Glass specialist." New York Classical Review: "GAMA XVI was more than just a novelty. This concerto for human had the unobtrusively fascinating sound of the finest ambient music. But then it turned, oddly, into something else entirely. Sasaki left the stage and was replaced by violinist Tim Fain, who played what was indeed a mini-concerto, full of Glassian repetition." Benjamin Beilman performed the Barber with the Sarasota Orchestra. Sarasota Herald-Tribune: "There could be no doubt that this still-young man pulled the music directly from his heart with extraordinary artistry. From the first lofty, wide-ranging dreamer’s tune to the wrenching melancholy in the second movement, I was entranced by the purity and emotional expanse of Beilman’s unique tone quality." Augustin Hadelich performed the Beethoven with the Orchestra of St. Luke’s. The Epoch Times: "Even before he began playing in the violin concerto, one could sense the orchestral music coursing through his veins. His playing was gorgeous throughout." Elina Vahala performed Jaakko Kuusisto's Violin Concerto with the Singapore Symphony Orchestra. The Straits Times: "Vahala's playing was top rate throughout the concerto, even if the unfamiliarity of the work might have made it less evident for listeners. Her tone, expressiveness and fluency were second to none. Kuusisto's Violin Concerto may never achieve the widespread popularity of Sibelius' concerto, but it was intense, refreshing and a worthy complement to the rest of the programme." Clara-Jumi Kang performed Saint-Saens' Violin Concerto No. 3 with the Naples Philharmonic. Naples Daily News: "Kang coaxed a rich soliloquy from her Stradivarius on the low tones of the second movement, a reading that said she wasn't hoarding her emotional payload for the flashy final movement. When it came, however, she gave it the fervor it deserves." Christian Tetzlaff performed works by Brahms in recital with pianist Lars Vogt. Independent: "No other violinist so steadfastly abjures the seductive capacities of their instrument, its luxurious warmth and potential range of colour. Tetzlaff goes for absolute clarity of detail and purity of intonation, and as a result Brahms’s dramatic and melodic richness here shone very brightly." Alena Baeva performed Bacewicz's Violin Concerto No. 7 with the American Symphony Orchestra. New York Classical Review: "Baeva was a magnetic presence, and the sound of her instrument, the fullness of tone, and her marvelously precise intonation were admirable and beautiful in and of themselves. Her strength and fire made the concerto sound like a masterpiece." Keir GoGwilt performed the Adès with the La Jolla Symphony. The San Diego Union-Tribune: "Violinist Keir GoGwilt vanquished the technical challenges of Adès’ concerto with simultaneous economy of effort and finger-busting virtuosity. He also displayed a beautiful, singing tone — when he was audible."